There are a ton of places to eat at the massive Walt Disney World. When you visit Mickey’s Florida getaway, you would probably want to have at least a couple of meals at some of the resort's top-rated full-service restaurants. However, it's likely that you would want to eat the majority of your meals at Disney World's casual, quick-service eateries. They are considerably less expensive and, as the “quick-service” category name implies, can get you fueled up and back on the rides in a jiffy compared to the more leisurely pace at waiter-service restaurants. They also tend to have lighter fare. Quick service doesn't necessarily mean fast food — at least not in the mass-produced, same-old-burgers-and-fried-chicken meaning of the term. Disney offers some surprisingly good and occasionally adventurous dishes at some of its quick-service nosheries. With the expert help of Lyn Dowling — a long-time reporter on Walt Disney World and a current restaurant reviewer for Florida Today — we narrowed down the resort's enormous collection of quick-service restaurants to the following ten top choices (plus one honorable mention). For the purposes of this list, we looked at the restaurants within the four theme parks and at the resort's hotels. We did include the BoardWalk district behind Epcot, but not the many restaurants at Disney Springs (the dining, retail and entertainment area formerly known as Downtown Disney). Don't fret; we've created a separate list of the best places to eat at the gargantuan Disney Springs, that includes quick-service-options. “Quick-service” refers to restaurants at which guests walk up to a counter, choose their items and cart their own food to a table. None of these restaurants accept advance reservations and most visitors make spur-of-the-moment decisions to eat at them. (For table-service restaurants, you should plan ahead. Learn how to make Disney World dining reservations.) By perusing the best restaurants listed here, you'll be able to identify the places you'd like to grab a meal, help plan a rough itinerary, reduce your spur-of-the-moment stress, help ensure that you would be treating yourself and your park posse to some great food, and help make your overall visit that much more enjoyable and memorable. Many of the quick-service restaurants are included on the Disney World free dining program. You won't find Mickey and the gang visiting the tables at any of these lower-priced eateries, but you can find out which table-service restaurants offer Disney World character dining. To satisfy your sweet tooth after you enjoy your quick-service meal, you can check out Disney World's best snacks and desserts. By the way, if you want to make your quick-service meals even quicker, consider using Disney World's mobile order feature. 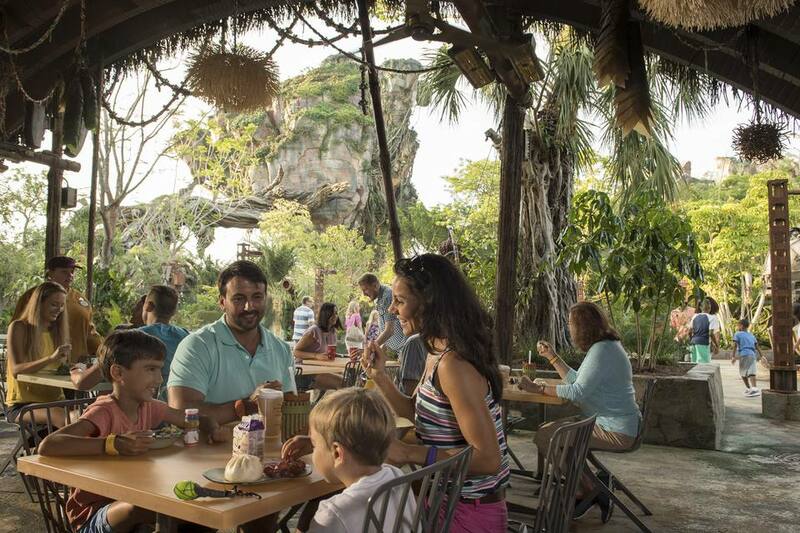 Introduced in 2017, it allows resort visitors to order food and beverages in advance by using the My Disney Experience app on your mobile device. You can place orders for participating locations on the day of your visit and pay in advance. When you arrive at the restaurants, you'll be able to pick up your meals and proceed to a table. The heavenly goodies in the pastry case at Les Halles will make your tastebuds swoon. In fact, the French patisserie's flaky and scrumptious treats are among the best desserts and snacks at Disney World. But you'll also go crazy for Les Halle's crusty baguettes and the delicious sandwiches served on them, as well as its croissants, soups, salads, cheeses and other savory entrees. Among the menu items are Jambon Beurre, which includes ham, cheese and dijon mustard butter on a baguette, Tartine Provencale, a delicious combo of grilled eggplant, peppers and goat cheese on country bread and Quiche Lorraine, the famous savory French pie dish with ham and gruyere cheese. Consider adding Les Halles to your itinerary when you visit the resort as a great place to grab both a quick, reasonably priced, tasty meal as well as some mind-blowing sweet treats. The Grand Floridian is one of Disney World's best hotels and a great place to visit, even if you are not staying there. It's also a great place to dine. Two of the resort's best table-service restaurants, Citricos and Victoria and Albert’s, can be found there. But the Grand Floridian is also a wonderful place to grab a casual meal at Gasparilla Island Grill. Best of all, the restaurant never closes. Whenever the urge strikes you, you'll find the Gasparilla Island Grill’s doors open. One of the reasons why the food is so good here is that the chef who helped develop Victoria and Albert’s into Disney World’s premier restaurant oversees the kitchen at the Gasparilla Island Grill as well. Consider the tasty pizzas, fresh salads, burgers and yummy sandwiches such as chicken and brie on a brioche bun. Breakfast options include an egg and sausage wrap, baked quiche and the Disney World staple, Mickey-shaped waffles. In the wee hours, the grill offers a limited menu of pizza, including a loaded family-size pie with four cheeses, sausage, pepperoni, green peppers, mushrooms, and onions. Be Our Guest is also on our list of Disney World's best table-service restaurants — yes, the lovely dining spot located inside The Beast's castle has an elegant (if pricey) dinner menu. But for breakfast and lunch, the restaurant is transformed into a quick-service eatery with significantly lower prices. It's an intriguing dual-purpose dining space that is something of an innovation from Disney. The lunch and dinner menus are virtually entirely distinct from one another. Midday entrees include Croque Monsieur, a gooey sandwich filled with carved ham, gruyere cheese and béchamel that is similar to the famous Monte Cristo at Disneyland's Blue Bayou. Other choices are braised pork, French onion soup, and vegetable quiche. Ooh la la. For breakfast, the restaurant serves a Croque Madame, which is similar to the Monsieur, but includes a fried egg. Another morning option is a croissant doughnut (elsewhere known as a “cronut”) topped with pastry creme, banana-caramel sauce and chocolate ganache. It's as decadent as it sounds. While the food is tres magnifique, the ordering system is tres unique. Instead of ordering at a counter, waiting for the meals to be prepared and delivered on a tray, and then wandering around the dining room in search of a table (which is the norm for most of the other quick-service eateries at Disney World), guests order their meals either at a self-service kiosk or with a Disney cast member and are given a "magic rose." Guests place the GPS-enabled device on their table (which allows servers to match the meals with the patrons) and their food is delivered to them. It's a pretty nifty concept. At least half of the fun of dining at Be Our Guest is marveling at the richly detailed Beauty and the Beast theme, which includes the cavernous ballroom and more intimate seating in the Rose Gallery and the West Wing. The great thing about coming for breakfast or lunch is that you could enjoy the ambiance (and savor the delicious food) without having to pay royal prices. If it all sounds good, you might want to get the Combination Bowl. It includes marinated, grilled beef and chicken with crunchy slaw, boba balls and your choice of other add-ons. Or you could go for the Satu’li Sampler Platter, which offers your choice of proteins with a taste of all of the restaurant's bases and sauces. For dessert, the Canteen offers a specialty Blueberry Cream Cheese Mousse. Like the rest of Pandora, it looks otherworldly. You just can't go wrong at Disney's Animal Kingdom Lodge (assuming you have a taste for African-inspired dishes). From the Indian/African-mash-up menu at Sanaa, to the exquisite fine dining at Jiko - The Cooking Place, to the sumptuous Boma - Flavors of Africa buffet, the hotel’s restaurants are among Disney World’s best. Its quick-service entry, The Mara, is also wonderful. Among the intriguing menu items are potjie, an African stew with a variety of meats, vegetables, chickpeas and raisins that is served on basmati rice. Other entrees include falafel; a chicken salad with lentils, chickpeas and a chili-cilantro vinaigrette and a barbecue pork sandwich. If you or your dining pals find the African fare too exotic, there are some American standards such as flatbreads and a hot dog available. A Bobotie Platter, which is an egg custard that includes turkey, peppers and raisins, is available for breakfast. For late-night noshers, The Mara stays open until 1:30 a.m. According to Dowling, the Katsura Grill may be one of Disney World’s most underappreciated and off-the-radar restaurants. Among its offerings are a California Roll and a reasonably priced sushi combo plate. Ramen and udon noodle dishes are also on the menu as are tasty entrees such as Garlic Shrimp and Chicken Cutlet Curry which both include rice and a salad. Tokyo meets New York City for the Katsura Grill’s dessert, Green Tea Cheesecake. Sake is available as well as Japanese beers on tap. Located on a terrace far from the park’s main concourse, the restaurant offers a respite from the noise and teeming crowds. This is about as far from typical fast food fare as you can get (while still technically, being fast food). It might be out of the comfort zone of some more conservative diners, but if you have even a little sense of culinary adventure, consider a visit to the highly regarded Epcot eatery. Meals include a Shawarma chicken and lamb platter that features thin-cut slices of deliciously seasoned meats that have been slow grilled on a spit for hours. The dish includes hummus, tabouleh and couscous salad. This and other entrees, such as a ground meat Moroccan kefta sandwich, are similar to what you can order at the nearby Restaurant Marrakesh, but at a fraction of the cost (and the time it would take to order and dine at the table service restaurant). Like the rest of the Morocco pavilion, the Tangierine Cafe has some lovely mosaic tiles and other Northern African ornamentation. It's easy to find the Flame Tree Barbeque; just follow your nose. The intoxicating aromas wafting from the dining spot will lead you there. Its menu features ribs, smoked chicken and a smoked pulled pork sandwich, all served with coleslaw and baked beans. Lighter fare includes a mixed greens salad with roasted chicken and a watermelon salad. If the ribs aren't gut-busting enough, top it off with banana maple cake. Nothing goes better with BBQ than an ice cold beer. Fortunately, Flame Tree has a limited variety of beers available. As with Les Halles Patisserie, you might think that the BoardWalk Bakery would specialize in gooey pastries. And as with Les Halles, you'd be partly right. Sure, there are tempting cupcakes, tarts, and other baked goods, but there are also some delicious light meals available. Dowling is partial to the the roast beef sandwich, which she says is gigantic. It’s served on herb focaccia with mustard, sour cream and caramelized fennel and onions. Other entrees include a roasted vegetable sandwich and a salad served with grilled chicken and apples. Don't forget dessert. For breakfast, the bakery offers a BoardWalk Bounty Platter, which includes scrambled eggs, home fries, bacon, sausage and a small croissant. It’s not what America's liberty-seeking forefathers ate and it’s not particularly adventurous, but the decidedly American fare at this restaurant will please most palates. Meals include a fried shrimp and fish platter and a lobster roll. Lest you think it's all seafood, all the time, there are other items such as chicken breast nuggets and a wedge salad. There is also a Land and Sea Trio, which includes fried shrimp, breaded chicken, and battered fish You can get it with a side of fries, or, if you prefer a lighter accompaniment, green beans and carrots or apple slices. As you might expect, the decor is early American with a nautical flare. If the main dining area is full, head upstairs to the often-quiet, somewhat hidden second dining room. Sunshine Seasons is divided into different food stations. For example, the Asian counter offers dishes such as Mongolian beef. Salmon with grits and succotash as well as rotisserie chicken are available at the grill station. A sandwich counter features un-burgers like a vegetable flatbread and fish tacos And a soup and salad station has lighter choices available. For Epcot warriors in a hurry to get back to Future World, Sunshine Seasons has pre-prepared grab-and-go items, such as a chicken wrap and side salads, ready for the taking. It may be "fast food," but even the desserts are inspired. Choices might include Mickey Oreo Cheesecake or a chocolate mousse cake. In a word: yum! The reason why Sunshine Seasons merits an honorable mention? Dowling says the food can be uneven. She's had some great meals there as well as some occasional not-so-great ones.